The next Video Jam event will feature as part of Islington Mill’s “Rule of 3” series exploring new ways to further creative expression at a time of austerity. The Video Jam audience looks on attentively. For their first birthday celebrations, the Video Jam group will present a showcase at Islington Mill, Salford, alongside other installations at the opening Rule of 3 event on 24 January. The Video Jam organisers have called for submissions be part of the forthcoming programme in either the short film or live music aspects of the show. In the past, they have staged an eclectic array of musicians, poets and performers each responding to a different visual accompaniment submitted by local filmmakers. Islington Mill will play host to other installations on the same night, including light and sound artist Joanne McClung, illustrative artist Stephen Nuttall and an open studio of artist-in-residence Rachel Pursglove. Other Rule of 3 events take place on 7 February and 21 February and its central aim is to act as a forum for discussion and to pose and answer questions regarding the nature of current art practice, such as funding, originality and communication. 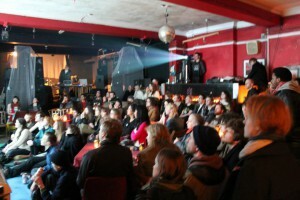 Previously, the unique Video Jam events have taken place at Antwerp Mansion in Rusholme, but the organisers hope the temporary move to Islington Mill will introduce the programme to new audiences and are likely to return to the Mansion for a regular slot later in the year. The next Video Jam will take place on Thursday 24 January. You can register your interest to take part here. The closing date for submissions is 15 January.